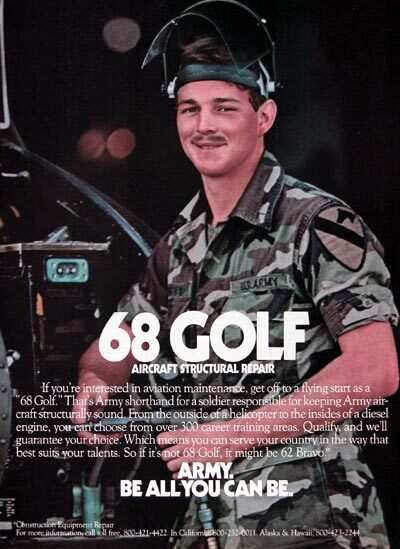 1983 U.S. Army original vintage advertisement. If you're interested in aviation maintenance, get off to a flying start as a "68 Golf". That's Army shorthand for a soldier responsible for keeping Army aircraft structurally sound. From the outside of a helicopter to the insides of a diesel engine, you can choose from over 300 career training areas. Qualify, and we'll guarantee your choice. Army. Be all you can be.